From time to time, it may be necessary to offer your customers the opportunity to sort the product list in a new way. Default Magento Sorting Methods for a product list are Position and all product sortable attributes, with Used for Sorting in Product Listing equal to "Yes". The Advanced Sorting Extension extension by MANAdev adds additional sorting methods for every page, on which a product list is shown. You may also wish to create your own Custom Sorting Methods. When this is necessary, you may combine up to 5 standard or additional methods, as well as other product attributes. For example, you can create sorting methods Price – High to Low and Price – Low to High, and show them instead of standard Price sorting method. Important! All configuration, described below, can be done globally or on store level. Newest – to sort products by product creation date. Newest products will be highest on the list. Bestsellers – any products which were sold more than others will be highest on the list. Most Viewed – products which are most viewed by store customers, will be highest on the list. Biggest Saving – products with the the greatest difference between Regular Price and Special Price will be highest on the list. Now in WishList – products which have been added to customer WishList highest on the list. Quantity – products with the largest quantity in stock will be highest on the list. Top Rated – products with higher customer rating will be highest on the list. Review Count – products with higher customer review count will be highest on the list. Out-of-Stock is an additional setting, which can be enabled for all sorting methods. 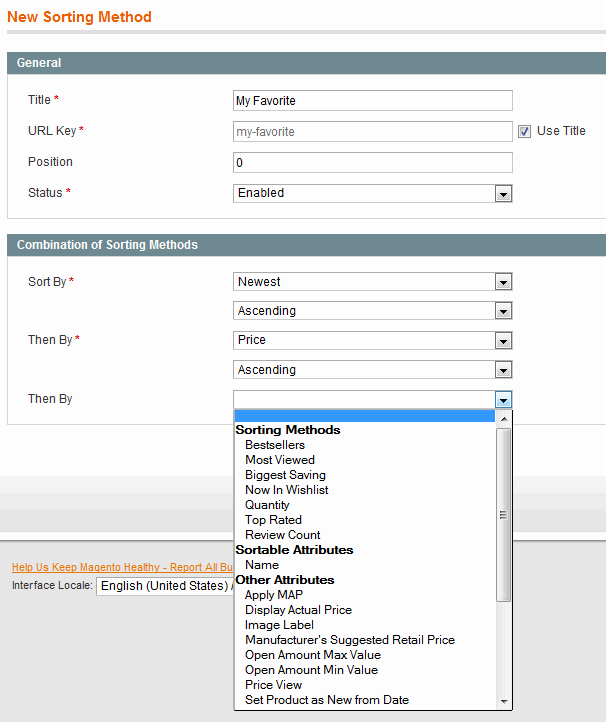 This setting will move products which are out of stock to the end of any sorted product list. Every method can be enabled or disabled, and their relative position in any sorting method list can be set by you. After the extension is installed, Newest, Bestsellers, and Most Viewed are enabled. 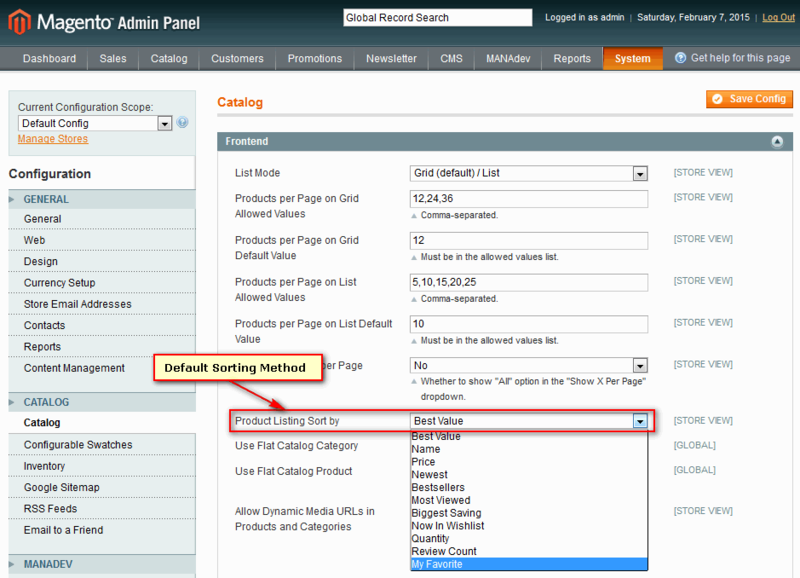 In Magento Admin Panel go to menu MANAdev -> Custom Sorting Methods. Press Create Sorting Method button. Here, up to 5 several sorting methods, sortable or other attributes, can be combined. For every sorting method chosen Ascending or Descending order can be set. Title – the name of sorting method. URL Key – URL Key which will be used to combine SEO friendly URL Key, if this method is selected. Position – sorting method position in sorting method list. Status – Enabled or Disabled. Allows you to add or remove this method to sorting method list. Sort By / Then By – sorting methods, which can be selected from list. Sorting Methods. Check part 1. Sorting MethodConfiguration above in this document. All enabled sorting methods will be listed here. Sortable Attributes - all attributes with "Used for Sorting in Product Listing" equal to "Yes". To find it, go to admin menu Catalog -> Attributes, open attribute and check Properties tab setting Used for Sorting in Product Listing. 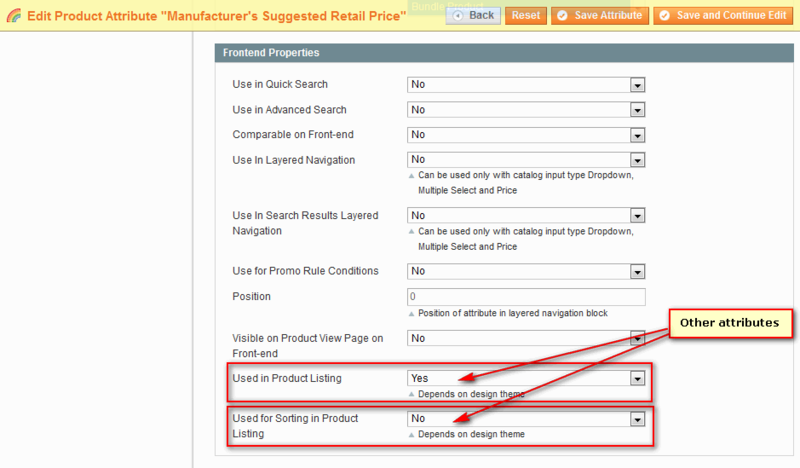 Other Attributes - all attributes with "Used for Sorting in Product Listing" equal to "No" and "Used in Product Listing" equal to "Yes". 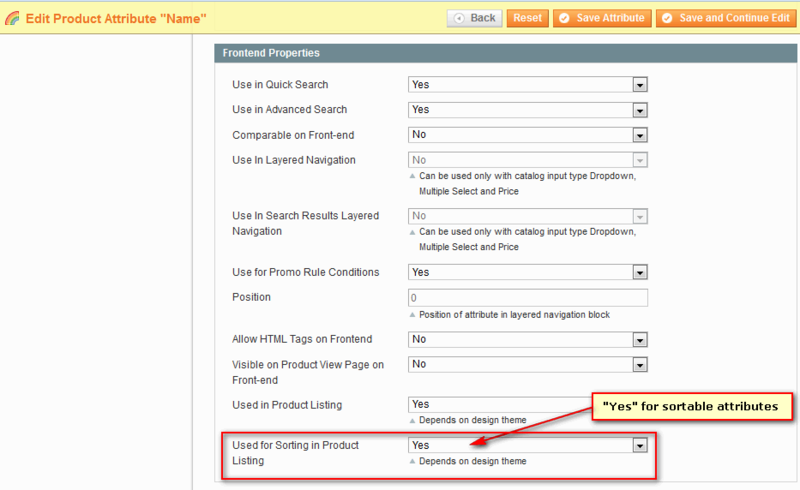 In Magento Admin Panel go to menu MANAdev -> Custom Sorting Methods. Press Create Sorting Method button. Type sorting title Price – High to Low or Price – Low to High. Check URL key. If it is not suitable, uncheck Use Title checkbox and type URL key. Enter position for the sorting method relative to other method in a list. 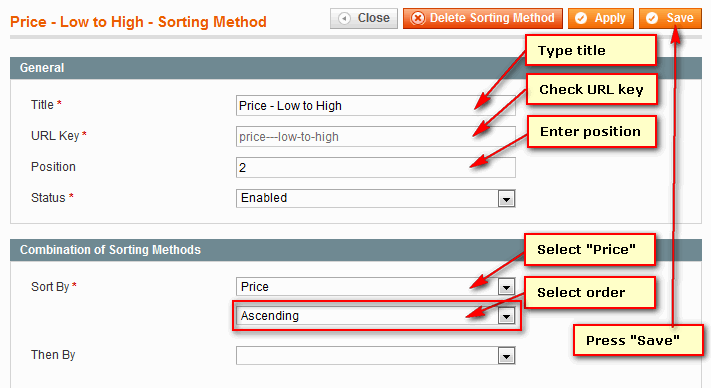 Select Ascending for Price – Low to High and Descending for Price – High to Low sorting methods. Repeat above actions to configure second sorting method. The Default Sorting Method will be automatically applied when you enter a product list page for the first time. 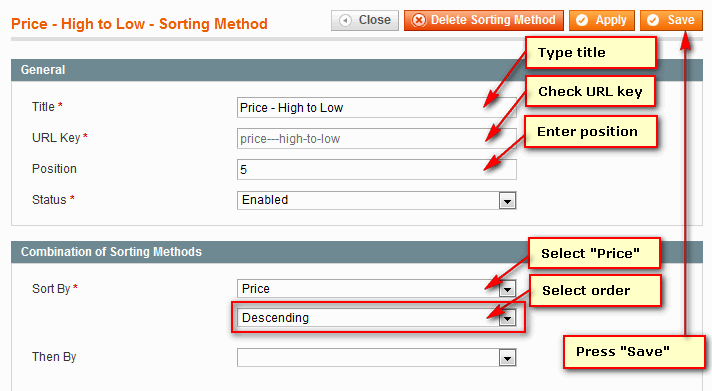 Global Default Sorting Method can be set in standard Magento Configuration Page. 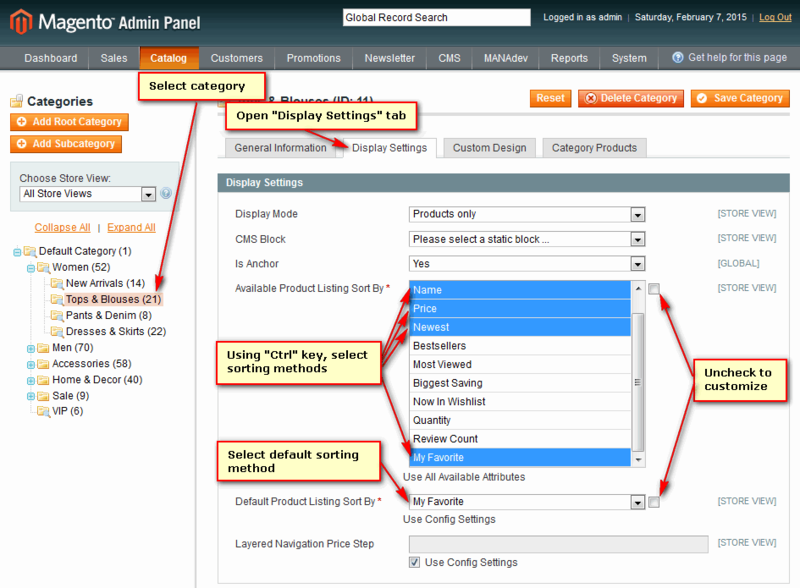 To find it in Magento Admin Panel go to System -> Configuration. Open CATALOG / Catalog section, Frontend parameter group. Settings Product Listing Sort by will let to select default sorting method from all enabled methods. Available Sorting Methods, as well as Default Sorting Method, can be modified on category level. 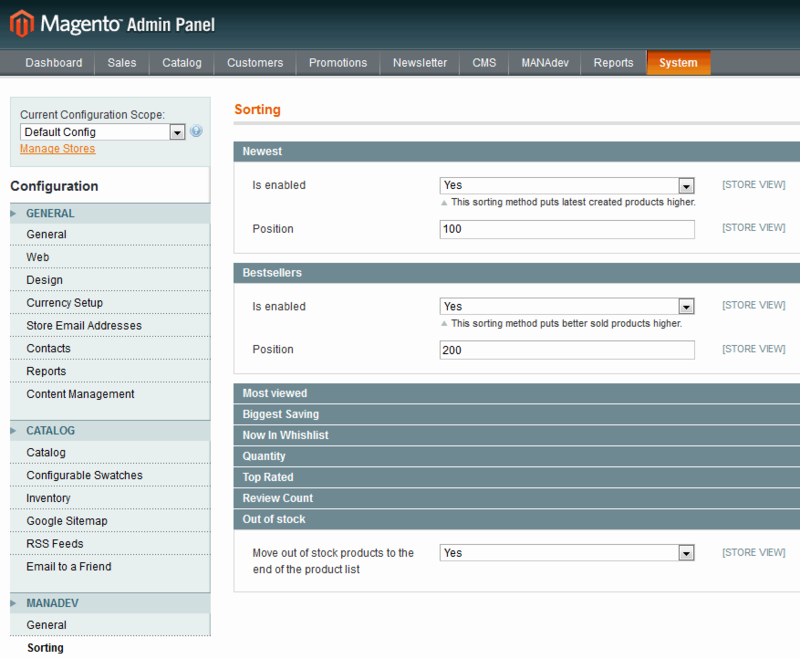 In Magento Admin Panel go to Catalog-> Manage Categories. Select category from category tree and navigate to **Display Settings* tab. Near Available Product Listing Sort By the checkbox Use All Available Attributes can be deselected when and if global sorting settings should be overriden. Using Ctrl key, items from the list should be selected. Also, you can customize the Default Sorting method for the category by selecting new value in Default Product Listing Sort By.